Are you familiar with the expression “the other way around”? I thought of this when I got a new iPad with an Apple Pencil. Unlike the new iPad, my old one uses the 30-pin dock connector instead of Lightning, and you’ve got to make sure it’s inserted with the right side facing up. If it doesn’t fit, you’ve got to turn it over and try the other way around. It can be a real pain in the neck, especially when you’re in a hurry. So, you can probably guess what it means from the sound of it. 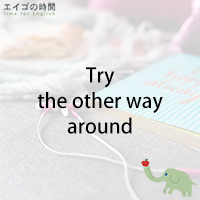 The other way around means “in the opposite way” or “with the order reversed”. Squares are rectangles, but not always the other way around. When you do something, you think first, then act. Not the other way around. Try the other way around.